Wayne Gretzky, the greatest hockey player of all time, said the key to success is not about skating where the puck is, but where the puck is going to be. The same rule applies to business. You don’t want to plan for the future by looking at the current economic landscape; you want to plan for what it’s going to look like. Good advice, but chances are you don’t have a crystal ball. However, we do have compelling data from the World Economic Forum, which suggests what the world will look like in the near future, by closely observing the recent past. 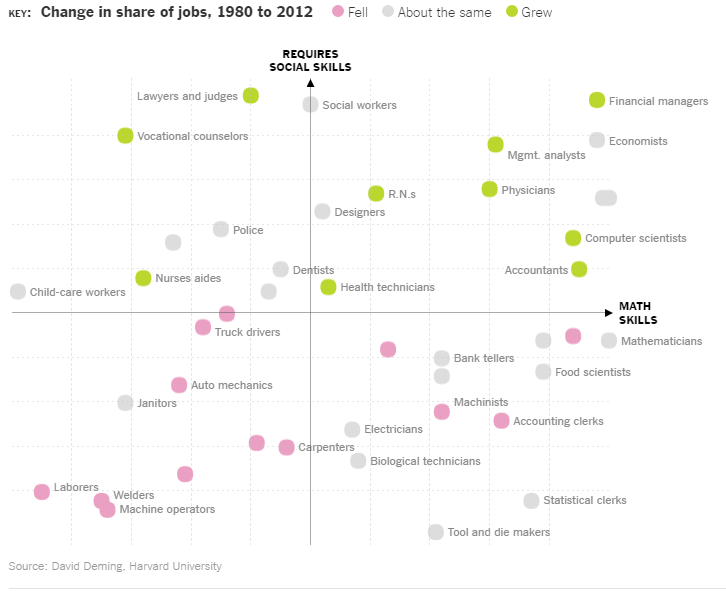 The jobs that are most likely to grow combine two key skills – mathematics and soft skills. For a company to succeed moving forward, they will have to become both more mathematically driven, while also increasing their soft skills. What’s interesting is that one or the other won’t do. Jobs that are strictly mathematical are prone to automation – think Turbo Tax replacing an accounting clerk. Conversely, organizations that rely solely on soft skills – say, a daycare center – are generally lower revenue, and have shown little growth. In an effort to predict the economy of future, the World Economic Forum looked at the past. They studied job growth from 1980 to 2012 to see what sectors saw job growth and which sectors saw job declines. The research found a correlation for positions that combined two key skills: mathematics and soft skills. Positions that require both saw the most job growth, whereas positions that require neither saw the most job loss. What’s worth noting here is to fully understand what soft skills really means. Yes, soft skills means being able to collaborate with people and being able to manage, skills that have always been important in the world of work. But it also means having a strong business sense. Yes, it’s one thing to have the ability to solve problems analytically, aka have strong math skills. But it’s another to know what problems to solve that’ll have the most impact on the business. A perfect example of this is data scientists, which LinkedIn found to be the second-most in demand skill right now. The best data scientists have both great business acumen and math skills – they know what problems to solve, and have the quantitative skills to solve them. It isn’t as if a company can suddenly change verticals based off this information. However, what they can do is use this information to better inform the direction of their company. For example, say you do run a daycare center. It’s time to make it more data-driven – what are the optimal times to have it open? Do you have an NPS score on your customers’ satisfaction level of your service, and do you have a plan to improve it. Conversely, say you are on the other side of the spectrum and are an accountant for individuals. More and more, software like Turbo Tax is eating into that business. That’s where the soft skills come in, in both how you treat people and business acumen. How can you create a better experience than Turbo Tax? And what value can you provide that a software like Turbo Tax cannot? These are hard questions. The companies that figure them out first will be the ones that see great success over the next five years, whereas the ones that don’t could face major challenges. Bottom line, it’s clear where the hockey puck is going – toward a data-driven world, with people who know what are the big problems to solve. The faster companies are able to train their workforce to meet that need, the more likely they are to reach (or, in this metaphor, score) their goal. The absolute most critical skill for any company moving forward? The ability to always be learning, as the economy is changing faster than ever today.